Who better to interview so close to Halloween, than K.A.Hambly, who has just released the second book in her The Town Halloween Forgot? 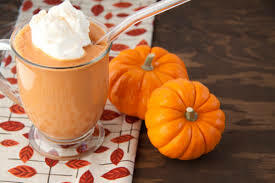 So why not grab a weird looking pumpkin drink, put your feet up, and join Kelly and myself for a chat. Danny Hallows and the Stones of the Aurora is the second book in the The Town Halloween Forgot series. I had only intended to write the one but after I had re-written the ending to the first book I realized there was an opportunity here for a series of books. So now I have four planned; the second out on the 29th October. 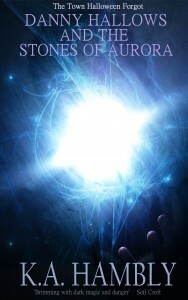 For this particular book I took inspiration from the Northern Lights, otherwise known as the Aurora Borealis. I’ve always been fascinated with it, although never seen it, so as I was pondering on ideas for the second part, I got to thinking that my character’s magic had to come from somewhere and so I took the Aurora and based this particular story around that. Well Danny, the main character is named after my six year old son. I wouldn’t say my character’s traits are similar to him as Danny in the book has just turned sixteen but if my son ever turned out like him, I think I would be very proud. Yet, if he starts showing signs of being a wolf, I think I’d be very concerned, of course. There are no wolves in my family that I know of and no magic stones or books. In the beginning when I normally just have a title and very little else, I’ll start writing, not thinking too much about plot or anything and just go with the flow and see where it takes me. More often than not this has played to my advantage. So when I have a substantial piece of work, I’ll then start planning. It’s probably the hardest way to work, but it works very well for me. But I don’t always stick to the plan. I think the best ideas come spontaneously. I do try and write every day, whether on paper or on the PC, I’ll try and get something down, even if it’s just jotting down an idea. Usually I write better at night. The fact that it’s being published ha-ha. The one thing that excites me the most is my son has been looking forward to seeing his name on the book cover. When I’m stuck for names or ideas, I usually get my children involved so they have been a big part of this process also. Elvis Presley because I adore him and he can sit and play us some tunes. The second would be Dracula. I love that book and being a vampire fan, he would be a great person to talk to – so if we starve to death he can make us all immortal ha-ha. And the third would be Shakespeare. Being a writer I think there would be a great opportunity here to learn something. K A Hambly lives in Swansea, South Wales with her husband and two children. She studied English and Media, where she wrote a thesis on Dracula (From Novel to Cinema), Vampires and Gothic Horror have always been an interest of hers so it is no surprise that she began writing her own vampire series in 2011. She states music and movies play a huge part in her inspiration.